Located to the west of Charlotte and next to Renaissance Park, the Charlotte Douglas International Airport (CLT) is also close to Belmont, Lake Wylie and Shopton. Charlotte Douglas has become one of North Carolina's busiest airports and is a gateway to the west of the state. Each year the facility handles over 30 million people, shifts around 180,000 tons of cargo and offers non-stop flights to 127 different destinations. The single terminal at Charlotte Douglas Airport is divided into five concourse areas (A to E) and features a total of 85 gates. Close to the terminal are three runways, while nearby a fourth is currently under construction. Transport options from Charlotte Douglas Airport include an airport shuttle, known as the Carolina Transportation Airport Express, which serves downtown Charlotte. The city itself is linked to the airport by a number of roads, such as the West Boulevard and the Wilkinson Boulevard. Many hotels offer courtesy airport shuttles, while taxis are available for fast transport to Charlotte and beyond, connecting its main districts and priced according to zones. Popular neighborhoods include the Forth Ward district, Uptown, NoDa and the fashionable district of Plaza Midwood. Known as the 'Queen City', Charlotte is a charming place with excellent shopping and attractions, including numerous museums and galleries. Many visitors head for Discovery Place in downtown Charlotte, where an interactive science museum, aquarium, planetarium and an indoor rain forest are contained under one roof. For day or night entertainment, Independence Square is located in central Charlotte and within easy reach of Douglas Airport (CLT). This is part of the city's main thoroughfare and comes with fantastic shopping, a wide range of eateries and an exciting nightlife. 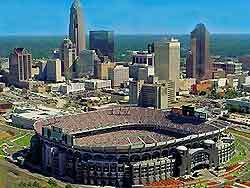 Businessmen frequently fly into the airport, since Charlotte has become one of the biggest and more influential banking centers in the whole of the US.